Ian Chapman hopes the 1-1 draw at Harlow Town on Tuesday night will get his side's season up and running. After losing to Potters Bar in the opening game, it was vital the Hillians got something from this game. But Chapman believes they should have had the game wrapped up in the first half. But Chapman believes his side could have had the game wrapped up by half time. He said: “Overall a fair result. First half we should have had the game out of sight. Charlie Bennett missed a header from two yards out. He’s got to score and he knows that. He added: “We have got to find a way of taking the sting out of the games. When passed the ball around well in the first half we ripped them apart. But in the second half we got pinned back too quickly." Burgess Hill Town had a shout for a penalty in the dying moments of the game after an attempted clearance for a Harlow defender hit a teammate's arm. But Chapman had no issues with the decision. He said: "Personally I would have been disappointed if it had been given against us. "It’s one of those if it’s given you’ve been lucky so I have no arguments with the decision." But after the disappointment of the opening day defeat to Potters Bar, Chapman was pleased. He said: “Overall I am pleased to get on the board and get a point away from home and hopefully it’s got our season up and running. 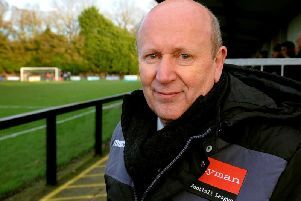 “After we lost to Potters Bar we were all down but they won 3-0 against Kingstonian on Tuesday who are supposed to be one of the favourites.